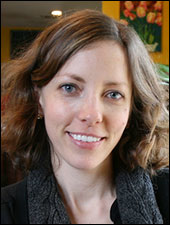 Helen Zoe Veit specializes in American history in the nineteenth and twentieth centuries, focusing on the history of food and nutrition. Her first book, Modern Food, Moral Food: Self-Control, Science, and the Rise of Modern American Eating in the Early Twentieth Century explores food and nutrition in the Progressive Era. Modern Food, Moral Food was a finalist for the 2014 James Beard Award in Reference and Scholarship. She is now writing a book called Small Appetites: A History of Children’s Food, which examines the history of children’s eating during the last two hundred years. Sponsored by the Traphagen Alumni Speaker Series Fund, the Franke Program in Science and the Humanities, and the Yale Sustainable Food Program. 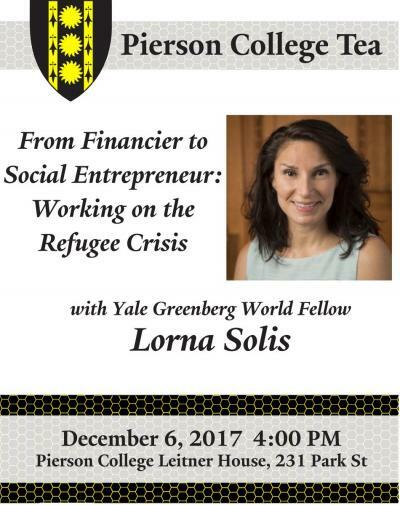 This event is open to the Yale community. Refreshments will be served. 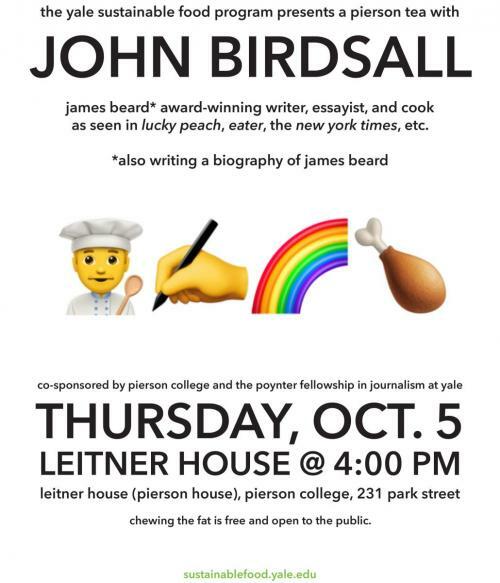 Join us with our guest, John Birdsall, James Beard award-winning writer, essayist, and cook. As seen in Lucky Peach, Eater, The New York Times, etc. talking with Professor Davis about the intersection of gay culture and food. With the Yale Sustainable Food Program providing appetizers and snacks inspired by James Beard! 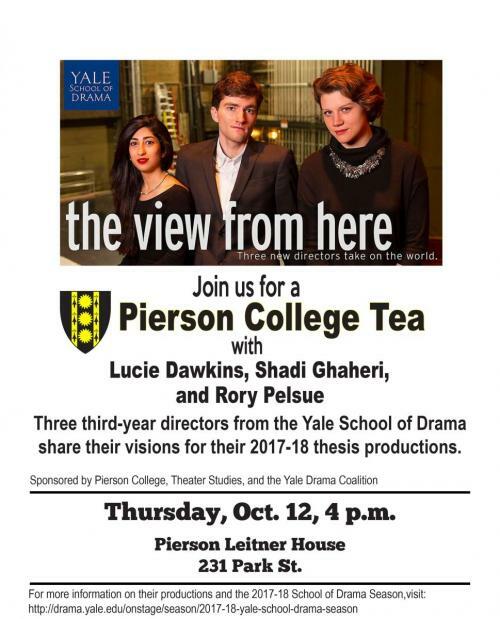 Join us as three third-year directors, Lucie Dawkins, Shadi Gherari, and Rory Pelsue, from the Yale School of Drama share their visions for their 2017-18 thesis productions. 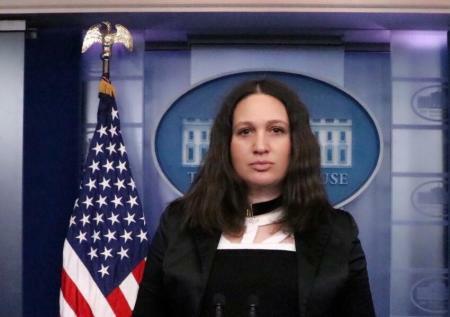 Ksenija Pavlovic is the Founder and Editor-in-Chief of the independent American media platform in the White House press corps, the Pavlovic Today, White House Correspondent, political scientist, and an uncompromising advocate for the freedom of the press. She was hailed by the American public for breaking the White House’s camera ban and streaming a briefing using the Periscope app. 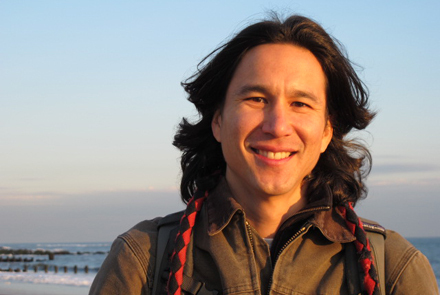 Timothy Pachirat (PhD 2008) works as assistant professor of political science at Umass Amherst and is author of two books. Every Twelve Seconds: Industrialized Slaughter and the Politics of Sight (Yale 2011) draws on nearly six months of participant observation research on the kill floor of an industrialized slaughterhouse to examines how massive processes of violence are normalized in modern society. Among Wolves: Ethnography and the Immersive Study of Power (Routledge 2018) is a seven act play in which ten contemporary ethnographers, a one eyed dog who can see the future, and an anonymous prosecutor gather to stage a trial of Alice Goffman’s controversial ethnography, On the Run. Pachirat is currently at work on a third book project examining the politics of transparency in contemporary industrialized animal agriculture. We’re sorry that this event has been canceled. We hope Ruby will come on another occasion. 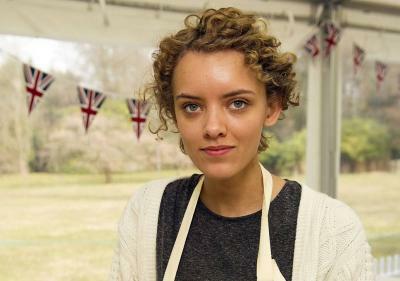 Ruby Tandoh is a food writer, columnist, and baker whose work has appeared in the Guardian, VICE, Elle, Food52, and the Financial Times, among other places. She appeared on series 4 of The Great British Baking Show, and now writes mostly about food, pop culture, art, and queerness. Most recently, Tandoh has penned Eat Up!, a “radical manifesto on how to take the guilt out of eating and put the pleasure back in.” Co-sponsored by Pierson College, the Poynter Fellowship in Journalism at Yale, and the Yale Sustainable Food Program.